When you need a super quick and easy recipe for a comforting bowl of chicken soup, this is it. 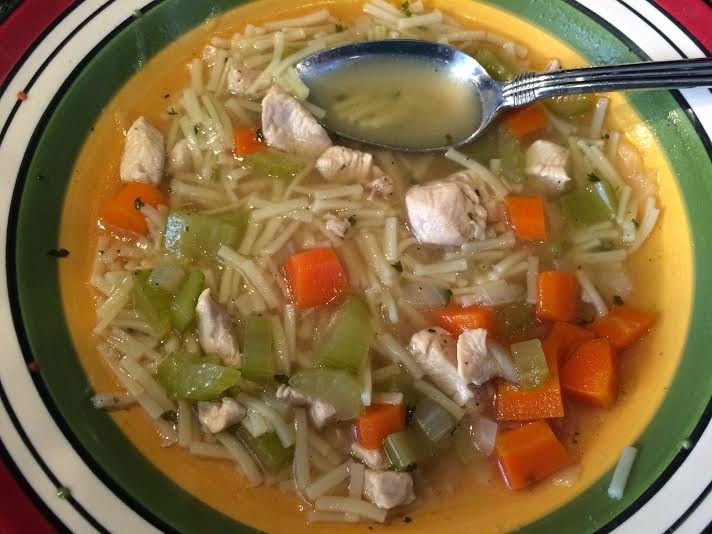 I've made chicken soup many, many times when you toil over the leftover turkey or chicken carcass after the holidays.....and I have to say, it's not really worth all that effort after making this. Heat olive oil in a large pot over high heat, and add diced chicken. Make sure the oil is very hot as you want your chicken pieces to brown and not just steam. The brown bits will add better flavor to your soup. 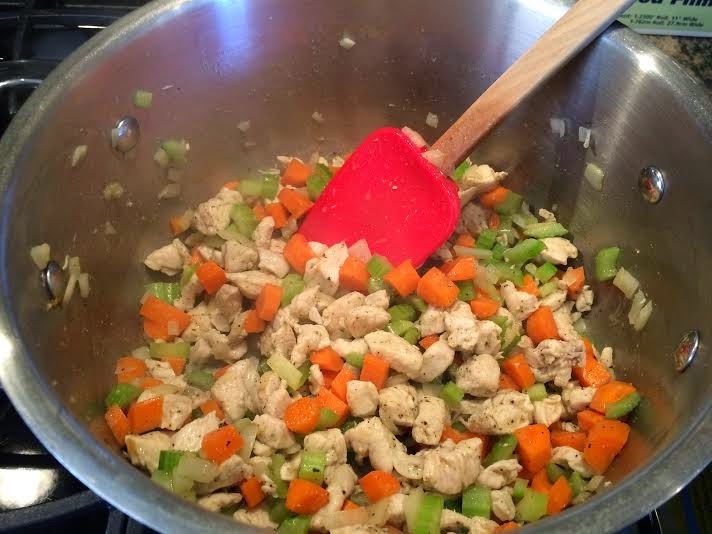 Once the chicken pieces have browned, reduce heat to medium and add the celery, carrots and onions. Cook and stir, scraping the brown bits from the bottom of the pot, for approximately 3 minutes. Add broth, water, and seasonings. Bring to a boil, then reduce heat to low and let simmer for approximately 20 minutes, until the vegetables are tender. Add the soup noodles, and cook until done (I use fine soup noodles and this takes about 5-7 minutes). This soup is a huge hit with both kids. Well, sort of. For one I have to remove all "the orange", and the other wants it blended up. Bah. So it's actually not a huge hit. But at least they eat this in some form and I'll take that as a win!